Free, Clean, Powerful & Easy-to-use PDF Converter! - Merge multiple PDF files into one. Convert specified PDF page and page range? Upgrade to PDF Pro! Convert all kinds of PDF files, and get DOS/Windows, UNIX, or Mac compatible Text files and Word files, for secondly editing and subsequent usage. Now you can use the latest version of PDFMate Free PDF Converter to convert scanned PDF files to edtiable and searchable documents with built-in OCR technology. The free version has a 3-page limit. If you want to read a PDF eBook on an eReader or mobile device such as iPhone, iPad, or Android phones and tablets, then this Free PDF Converter is the best choice for you. With this Free PDF Converter, you can also get JPG/JPEG images from your PDF files, convert PDF files to editable HTML without losing any original layouts, text content, images, and hyperlinks, or convert your PDF to SWF files. You can feel free to restructure the PDF file now. Set the output size as A3, A4, A5 with 4IN1, 2IN1 and 1IN1 layout, even you can add different kinds of password protections to the converted PDF file. With this Free PDF Converter, you can choose to convert the whole original PDF file to other formats, e.g, convert PDF to sheets of images with all original content included. You can also extract or ignore specific content from the original PDF files: you can extract only images of the original files, make new content without original images, hyperlinks, and so on. You can resize the PDF file in A3, A4 and A5 layout. Besides, it is available for you to add password protections (for opening, editing, copying and printing ) to your converted PDF file. Easy to use and effect to convert. With the user-friendly program interface, all you need to do is 1-2-3 click: Add PDF > Select conversion type > Click "Convert". Then you can finish converting from PDF to Text documents, EPUB Ebooks, HTML files, etc. like a Pro within seconds. The program also includes easy and clear built-in Help guide, which helps to convert your PDF files to target format of files within clicks and with perfect quality. This Free PDF Converter allows batch conversion; it processes at high speed and you can convert any number of PDF files to other format of files at one time. Free PDF Converter not only converts PDF to Text, EPUB eBooks, etc. fast in batches, but also converts PDF files without any original layouts losing. The output files are always super good and preserves original images, text, vector drawings, etc. It supports converting PDF files in all kinds of languages: English, Japanese, Traditional Chinese, Simplified Chinese, Korean, Latin, Turkish, Greek, German, French, Italian, Portuguese, Spanish, Russian, Polish, Czech, Slovak, Ukrainian, Bulgarian, Croatian, Romanian, etc. Preparation: Download PDF Converter Free, then install and launch it. Click Add PDF button to add PDF files for conversion. You can import as many as hundreds of files at one time. On the output format pane, choose the format you want to convert: from PDF to Text, EPUB Ebooks, HTML, Docx. (Word07), common formats of images(from PDF to JPG, PNG, GIF, BMP, TIFF), from PDF to SWF files, or from PDF2PDF. * After you select the PDF conversion type, you may click the Advanced Setting for further customization for the output files. After selecting the conversion mode and customizing the output settings, just click the button Convert and you can convert your PDF files in seconds. 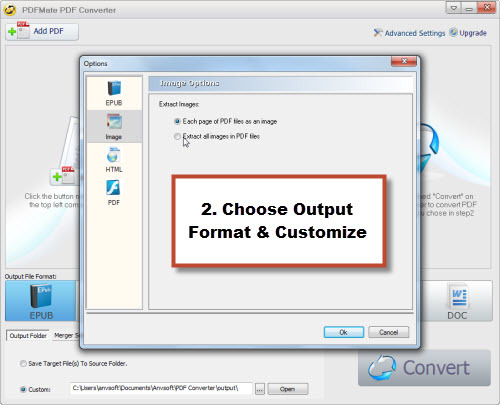 * PDF Converter Freeware also support batch conversion. If you want to convert a list of PDF files at one time, please choose the whole list before you start the conversion. When conversion is finished, you can click Open button under the pane to check the destination folder and view the converted files.